Handmade 1950's inspired Cowboy Skirt. Lovely crisp heavy cotton fabric with a very full skirt which will lift demurely when you spin and not show off you underwear! 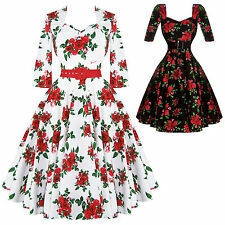 Vintage style dress Summer Size 20 1950's. Condition is Used. Dispatched with Royal Mail 1st Class. A handmade, beautiful summer dress. Looks divine with a tiered petticoat. Worn to Good wood revival a few years ago. Now sadly too big. Bodice is lined, skirt isn't, very full skirt. Centre back zip and tie detail across back as shown. Smoke free home . A great looking accessory to your 50's outfit for Goodwood! Weight 33 gms. Beautiful handmade dress dating back to the 1950s. Pale mint green silky type fabric with pink rose buds. No labels as this has been handmade to a high standard. Three quarter sleeves with turn back cuffs, typical of this era. Very good condition - apart from a very tiny nick in the fabric in the skirt area front side and a little exposure of the seam stitching. (see photo) Missing a belt. (Note - dress too small for mannequin so photo of back shows unzipped. ). Tara Starlet 1950s Wiggle Style Dress. 8. Condition is Used. Dispatched with Royal Mail 1st Class. May wash out, but it isn't too noticeable due to the fullness of the skirt (shown in last photo). Yellow and black skirt. Black spot pattern. Zip fastening. In great condition for its age! Full fit with ruffled hem. Pretty pale blue chiffon with white embossed flowers. Here we have a lovely swing skirt, bought from the US about 5 years ago. Period: 1950s. Colour: super spring colours of yellow, white and blue. Sheer, flocked overlay over yellow satin lining with cornflower blue velvet ribbon trim. Vintage 50s/60s Sundress Purple Ditzy Floral/ Handmade ?/ Full Skirt/14. Very pretty dress!! Lightweight fabric,would be fabulous with petticoats underneath for a rock and roll look! This is a tantalizing tartan 70s party dress. boned bodice with bow, back zip fastening, high-to-low hemline. made from soft light acetate in black and white check with bright red net petticoat and lining. I was given this dress some time ago it’s vintage 80s in a 50s style - but I’ve never worn it as I never got into it. I thought it was 12/14 but it’s nearer 8/10 with a side fastening zip. The shoulders and the back have some elastic in them so the dress would be comfortable on. The dress would be ideal for holiday or summer. I’ve photographed a slight tear on the lining by the side zip, but it can’t be seen when worn and doesn’t affect the zip usage. It’s a lovely little dress I can feel it’s well made and I haven’t noticed any other flaws in the dress or the lining. Features a sweetheart neckline, cap sleeves, and a gorgeous full hem. Closes in the back with a long zipper. The dress is missing the original belt. The hem could be easily shortened to knee length or worn as is because the flaws blend into the fabric. Womens Topshop Navy Blue White Polka Dot 1950s Vintage style A Line Party Dress UK 10. Condition is Pre owned , worn once perfect condition with no defects Gorgeous very flattering design, open back, polka dot detailing, puff sleeves Comes from smoke and pet free home Dispatched with Royal Mail 2nd Class. Vivien holloway Grace. Dispatched with Royal Mail 1st Class. Brand new and unworn. Sells 120.00 on website. Sateen material. Black wiggle dress with ruched/faux wrap over bodice. Made in Salzberg. Dates from the 1950s. Colour: black. This is not very noticeable when worn but reflected in the price. Unless otherwise stated, belts and accessories are not included and are not for sale. FITTING: Black Upper is Jersey Stretch Fit, Fitted Waist, Elastic Gathered Neckline Verstile Fit, Tiered Flared Skirt. Tiered Dress. TRIM:Lace Trim. SLEEVE: Short Cap Sleeve or Off the Shoulder. COLOUR: Black, Pink, Yellow, White & Green. IN THE PINK. 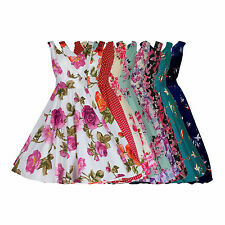 A 50s DESIGNED ROCKABILLY PIN-UP BUSTIER DRESS WITH LARGE WATER COLOUR STYLE FLORALS IN 100% COTTON. STRAPLESS AND BONED FRONT, BACK AND SIDES FOR ULTIMATE SECURE HOLD AND UPLIFT, WITH CHEVRON WAIST AND BACK ZIP FASTENING.